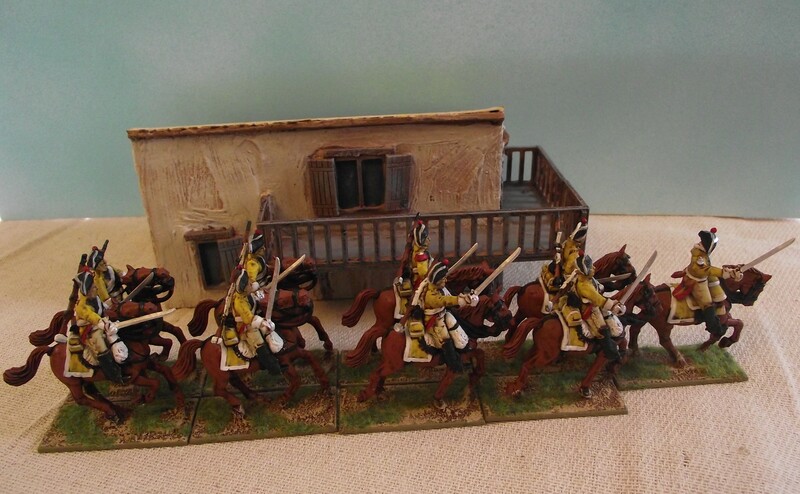 Just finished a Group of Napoleonic Spanish Dragons – with Leader. A Group is the basic movement unit in Sharp Practice and can only move if a leader is attached, usually it is made of 8 figures. Multiple Groups then make up a Formation. These were fun and easy to make – the bodies are Perry French Dragoons, and the heads are Victrix 1804 French Infantry (with a bicorne) – then it was just down to the paint job!!! With my bicorned Spanish Infantry (made out of Victrix 1804 French Infantry) the whole Spanish force looks decidedly dated for Napoleonic times….and that’s why I love them!! Unlike British Dragoons, but like the French Dragoons these troops also fought dismounted – so I will be converting some dismounted Perry French Dragoons to make a Group of them as well.